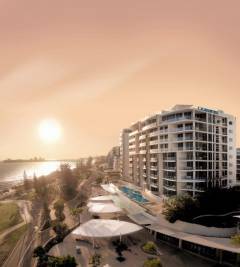 Oceans Mooloolaba is the only self-contained 5 Star apartment complex on The Esplanade at Mooloolaba Beach. Comprising of 2 and 3 bedroom apartments in various configurations, all have fully self-equipped kitchens with modern appliances and bar, ensuite and walk-in robes in the master bedroom, spa bath, plasma screen televisions, cable TV, air-conditioning and stylish european fittings. All apartments feature panoramic ocean views. At Oceans Mooloolaba enjoy being within walking distance of most activities and also receive daily maid service. There is also the fully equipped gym and steam room for the energetic or you can lay back and relax by the heated pool and spa, alternatively you can watch a movie in the theatrette.